Word processing tools can be your most powerful comrade in the document revision battle. Commands such as "track changes" and "compare documents" make it easy to keep a record of your changes. Later, you can either reevaluate each one or choose to accept them all at once. You can flag material for follow-up. When you are happy with your revised version, you can protect the document from various types of further changes or accidental deletions. A potential problem with such technology, however, is that the clutter of marked-up pages can become confusing. If you find yourself losing a sense of the big picture, try updating a working outline as you go. Keep this outline open in a narrow window on the screen alongside the pages you are revising. No matter how many changes you make to the screen copy, plan to edit a printed typescript at some point. You will almost always see different things when shuffling papers and making handwritten corrections than you do when scrolling through screen copy. The computer screen shows only a small part of the typescript at a time. Some problems - such as scrambled organization, or redundancy - simply aren't very noticeable unless several pages of the typescript are spread out in front of you. Whatever the eventual format of your typescript will be, save a copy with double-spaced lines and wide margins for paper-based revision. An inch of margin on each side, with at least an inch on the top and bottom, is not excessive. Use a standard font in a reasonable size, such as 12-point Arial, Helvetica, Times New Roman, or New York. Number the pages automatically in a header or footer (a separate text block that contains information repeated at each page top or bottom, respectively). Include a brief identifying title for the typescript and (especially in collaborative writing situations) your own last name or initials. To visually distinguish the header or footer from the text, format this material in a different font and smaller point size and include extra space around it. Command the program to insert a date and/or time into the header or footer, as well. These fields also are particularly useful when more than one person is working on a document, or when a document goes through several revisions. Dates and times can either be frozen, or can reflect the current date and time each time a document is opened or printed. Note that although it may seem old-fashioned and is admittedly slower, some people still find it most effective to use paper copy to examine overall organization, as well. If you are one of them, begin by making two or more paper copies of the document. Read one copy. Write notes in its margins such as "delete," "move to discussion," or "combine Tables 1 and 2." Follow the notes on the first print as you physically cut up the second copy and tape parts together in the new order. Save the annotated reading version as a safeguard against accidentally losing one or more paragraphs of text during your cut-and-paste work. Unfortunately, a quantitative theory to account for these results has not been formulated. Thanks are due to Joe Clotz for assistance with the experiments and to Boyton Fird for valuable discussion. A couple of other folks think so, too. We can't think of one, and neither can anyone else. Clotz did the work, and Fird interpreted the data. - Author unknown first draft, therefore, is essential if you want to come up with a well-written scientific paper. A scientific article should hold the attention of its readers by the importance of its content, not by its literary presentation. For this reason, the simplest writing style is usually best. This does not mean that one should avoid technical words. Often they are not only necessary, but the very best way to express a thought. 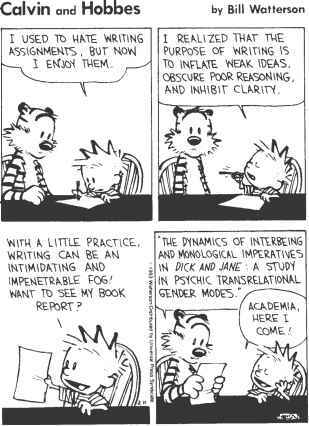 What it does mean is that verbose words and phrases should not be included in a vain attempt to impress the reader with the writer's intellect and scientific status. Sentence structure should not have to be puzzled over. Paragraphs should not ramble on and on. Clarity includes what some call "grace of expression." People have grace when they go beyond politeness and act with an eye to the needs and comfort of others. Graceful prose is much the same. It does not offend readers or divert their minds from the message. It does not try to impress readers with its erudition, or force them into side issues. It serves readers without imposing upon them. "Good prose is like a window pane," wrote George Orwell, the English essayist - it is transparent in the sense that it puts no visible obstacle between the reader and the message. Although the content of a document is more likely to determine whether it is accepted for publication than is its prose style, gracefully written text gives readers a sense that the author has mastered his or her subject. The first of those readers will be the editor and the document reviewers.